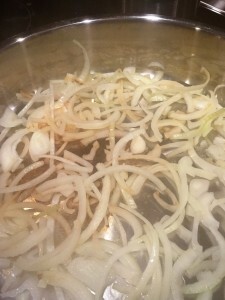 Sauteed onions soften and caramelize quickly over heat. There’s no need to use oil in sauteing onions, garlic, or veggies! Oil-free sauteing will save you from infusing your food with unnecessary fat. Instead, use water, veggie broth, beer, or wine. Chop your onions (or veggies)so they’ll be ready to drop in the pan soon as it’s hot (better for your pan), and have your liquid ready. Heat your frying pan so that a drop of liquid bounces and beads on the surface. There will be some steam. Drop the onions into the pan and stir as they brown. As soon as they begin to stick, add a small splash of liquid. We use a flat-edged wood spoon to scrape the browning from the pan bottom as we go. Reduce the heat as you go. For example, on our electric stove we start at high (9.5) but are down to 5.0 within a couple of minutes. 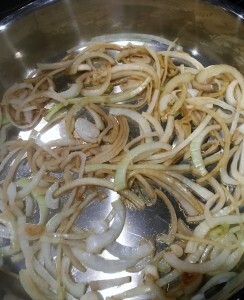 As soon as onions begin to stick and brown, add a bit of liquid and move them around, scraping up the browning. As a bonus, cleanup from water/broth/beer/wine sauteeing is easy.